We sell Michael's Originals products like Loofco Washing Up Pad - Luffa (Loofah) online in the UK and directly from our award-winning store in Scotland. LoofCo Washing-Up Pads are hand-made in Egypt from loofah plant and cotton string. A 100% biodegradable alternative to plastic washing-up sponges. 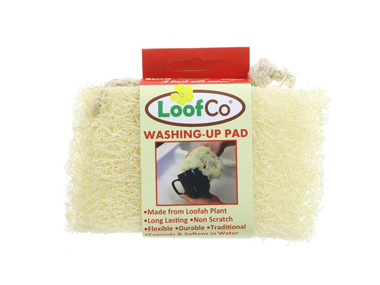 LoofCo Washing-Up Pads are hand-made in Egypt from loofah plant and cotton string. A 100% biodegradable alternative to plastic washing-up sponges. The Washing-Up Loofah Pad fits neatly into the hand & when immersed in water swells up to become a soft, spongy and flexible pad. It's soft enough for non-stick pans and supple enough to fit into mugs. Each durable pad will last for months and when worn out can be composted. Each pad measures approximately 13cm x 8cm loofah in packaging with a convenient cotton hanging string. Flattened for transport to save space. After they've worn out, use them for cleaning the toilet or simply chuck them in the compost bin, where the luffa washing up pad will decompose. We sell real Michael's Originals and other Homeware directly from our shop in Scotland and online throughout the UK. View more products from Michael's Originals. Where can you buy real Luffa Washing-Up Pad safely online? If you are wondering where you can buy Loofco Washing Up Pad - Luffa (Loofah) safely online in the UK, then shop with us. We are an actual health foods shop; with real people selling real foods and products. Our award-winning independent shop is located in Stirling, Scotland since 1976. You can buy our Homeware in store or safely place an order with us online or over the phone. Luffa Washing-Up Pad - Loofco Washing Up Pad - Luffa (Loofah) in Homeware and Household.